It’s been almost two weeks since I’ve arrived in Ankara. Feeling a bit more settled as I’m getting to know the rest of the SSC team members, working with our clients as we completed the initial planning phase last week and starting to delve into our recommendations this week, and becoming familiar with a new setting and routine. During this short time, there are a few sights and sounds that will stick with me as reminders of my experience in Ankara. I expect this list will expand as each day goes by. The day starts with a 5 am call to prayer that permeates the city streets which I can hear softly through my hotel room window (some mornings this sounds louder than others). “Taze simit!” (fresh bagels) is heard down the street as a second morning wake-up call as vendors stroll the streets to get your attention and sell their homemade sesame seed bagels. 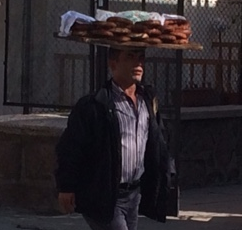 While these bagels can also be found in local bakeries, the experience of buying them from someone who balances a tray on their head is much more interesting. Attended an International Women’s Day event in Cappadoccia (~4 hours SE of Ankara) organized by ASAM. Spending an afternoon with over 1,000 Middle Eastern refugee women and children dancing, eating and laughing was quite an experience. 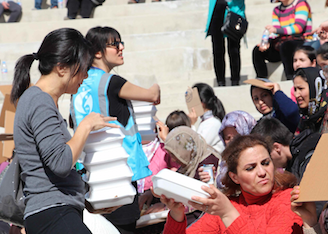 We didn’t know what to expect prior to the event and merely offered to help distribute food and drinks. When we arrived and saw a small amphitheater full of women and children, we knew it was a celebration that we were glad to be a part of. And lastly…my favorite spot to grab a quick Gözleme filled with spinach and potato. 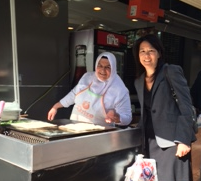 How can I not enjoy a local snack made by this friendly Turkish woman? She smiles and greets us everyday when we walk by her stand on our way to the office. As we leave, she says “Auf Wiedersehen” (German for good-bye). This is great! Keep the stories coming and be careful in the street!